On numerous occasions, terrorists have attempted to destroy airplanes with the use of liquid explosives. For this reason, there is a 3 ounce limit on the amount of liquid that can be brought through the checkpoint. It would be of benefit to the traveling public if liquid restriction were removed, and thus travelers could take liquids, drinks, paste, etc., across the checkpoint as was done in the past. TSS has developed patent-pending software that runs on conventional checkpoint X-ray security systems that automatically analyzes and detects liquid explosives. The TSS software works in both cluttered bags (as shown), and for the highest accuracy, works in container bins. This technology has been evaluated by the US Government, and the results show that the TSS solution provides the best-of-the-best solutions for liquid detection using conventional X-ray sources. 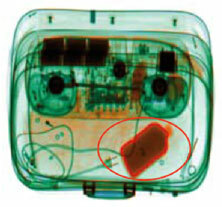 Both the traveling public, and the Security Screeners can benefit from accurate Liquid Detection. This capability allows travelers to move through the checkpoinht with less restrictions. For Airport Screeners, this allows them to focus on threats, and less on liquid detection. The benefits are less inconvenience for the traveling public, accurate threat detection of liquid threats, and increased focus on non-liquid security threats. For more Information on Liquid Detection, contact us.